It’s still got traditional multiplayer modes like Control and Deathmatch, and the fan-favorite “Zombies” mode, but the big addition in “Call of Duty: Black Ops 4” is the Battle Royale mode: Blackout. In a surprising twist, the “Call of Duty” version of the insanely popular Battle Royale game type is a fresh, innovative take on Battle Royale – rather than the copycat mode that many were expecting. It’s so good, in fact, that “Fortnite” and the rest of the Battle Royale competition could take a few cues from Blackout. 1. The Blackout map is still huge, but it’s small enough to easily traverse the entire thing in a match. No flying magical bus, and no derelict plane ride — Blackout starts with a helicopter formation. 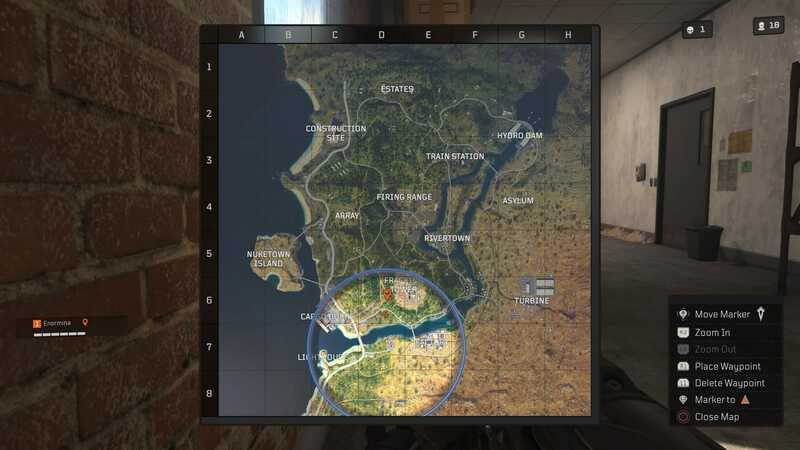 The vast stretches of open world you’ll find in games like “Fortnite” and “PlayerUnknown’s Battlegrounds” (“PUBG”) don’t really exist in the “Call of Duty” Blackout mode. Instead, it’s pretty easy to run from major area to major area while stopping on the way for supplies in various abandoned houses and gas stations. The speed at which you can run from one area to the other means less time spent running in terror in the wide open, hoping against the odds that no one’s spotted you through the lens of a sniper rifle. 2. The vehicles, especially the ATV, are far better and easier to drive than in any other Battle Royale game. There are two main land-based vehicles in “Blackout”: the ATV seen above, and a large-ish flatbed truck. Both are delightful in their own ways. The ATV is incredibly fast and versatile. Sure, you’re out in the open, but you’re going so fast (and able to hop off just as quickly) that the risk is well worth the reward. And if you’re playing in duos? Your buddy can hop on the back and fire at fools while careening over yet another hill. In the case of the truck, it’s like driving a mobile bunker. Pull up to a house, hop out of the driver’s seat and into the flatbed: Voila! Instant cover! In both cases, vehicles are able to traverse vast swaths of the map. No gas required (like “PUBG”) and no wonky driving physics (also like “PUBG”); no friend required to push the shopping cart (like “Fortnite”). 3. The “Quick Equip” function is a game changer for Battle Royale on consoles. The “Quick Equip” function can be seen at the bottom of the screen above, enabled by pushing up on the d-pad. One of the worst things about “Fortnite” is how needlessly complicated its controls are. Just swapping between weapons is needlessly complex, to say nothing of learning how to drop items and build. Blackout smartly streamlines those systems into a simple “Quick Equip” menu. At any time, simply tap up on the d-pad and you’ll see a quick and easy way to access your entire inventory. From here, you can quickly add attachments to weapons, switch consumable items out for other consumable items, and use perks (I’ll get those in a moment). And, given that we’re talking about a Battle Royale game, inventory rapidly expands throughout each match – thus, having the Quick Equip function is a real game changer. You don’t have to be a pro to quickly swap grenade types! Hooray! 4. The perk system is a brilliant new wrinkle on Battle Royale. The “Looter” perk allows you to see all loot in the nearby area, even through walls. It’s tremendously helpful! One of the defining characteristics of “Call of Duty” multiplayer is the concept of “perks.” The concept isn’t anything new to games: Think of perks like a temporary power-up. In the case of Blackout, you pick up various types of perk – Brawler, or Looter, or Medic, or a variety of others – and they offer temporary … perks. In the case of Looter, for example, you’re able to see the outline of any loot near your character. That’s tremendously helpful, as you can scan a building’s loot from the outside instead of running in and sifting through it all yourself. You may also notice that loot is slowly disappearing from the house you’re looking at – likely because someone is grabbing it quietly. And now you’ve got the jump on them! A well-timed perk use in Blackout can mean the difference between life and death, and it’s a brilliant new twist to the Battle Royale formula. 5. Forget about hiding and healing — Blackout incorporates it into gunfights. The formula for gunfights in “Fortnite” is simple: Try your best to take out the enemy while rapidly building. If you start running low on health, your best bet is to create a temporary shelter – hiding from the enemy while you attempt to recoup health using potions. In “PUBG,” the situation tends to be a bit more long distance – taking carefully aimed sniper shots from across vast distances, with the occasional hidden moment of healing. In Blackout, healing is incredibly fast, and it’s directly mapped to a button permanently. Moreover, you can heal up to (and even beyond) your original, full health amount. As such, healing is a core component of gunfights in Blackout. If you’ve only got a moment to heal, do it while running for your life! Blackout not only enables that, but it encourages that kind of action. 6. There’s only one type of “rare” weapon: Gold. You know what “Fortnite” doesn’t need? A color-coded loot system. Is this purple shotgun better than this green rifle? Who cares?! Apparently the folks behind “Blackout” felt the same way. There’s only one type of “rare” loot in Blackout, and it’s golden weapons like the rifle seen above. I don’t mean that there’s only one type of rare gun, but that there aren’t levels of rarity. Instead, you’ll occasionally find a genuinely rare, golden weapon that comes pre-loaded with all manner of accoutrement. In the case of the sniper rifle seen above, it comes with a super long-view scope, a stock for increasing stability, an extended magazine for additional bullets, and more. In general, Blackout is a streamlined, tightly-built version of Battle Royale that makes the competition look shaggy (“Fortnite”) and messy (“PUBG”). Looking for a full review of the Blackout mode of “Call of Duty: Black Ops 4”? We’ve got that right here. The long and short is this: “Blackout” is an excellent new addition to the world of Battle Royale games, but it’s probably not worth paying $60 for “Black Ops 4” just so you can play one game mode. That said, “Blackout” makes major improvements on the Battle Royale formula popularized by games like “Fortnite” and “PUBG.” With any luck, some of those improvements will make their way into the two biggies – or maybe “Blackout” will become its own free mode? Here’s hoping.